Revenue in the Belts segment amounts to US$8,670m in 2019. The market is expected to grow annually by 4.6% (CAGR 2019-2023). In global comparison, most revenue is generated in United States (US$1,905m in 2019). In relation to total population figures, per person revenues of US$1.18 are generated in 2019. Belts, bandoliers and girdles are clothing accessories that are worn at the waist to confine outer garments like trousers or dresses. The market segment does not cover seat belts for vehicles of any kind. Since the incorporated input data from statistical offices mostly measures belts in terms of kilograms a standard conversion rate of 150 g per unit has been used to estimate volume sales and prices. Reading Support Revenue in the Belts segment amounts to US$8,670m in 2019. Reading Support The Belts segment is expected to show a revenue growth of 5.2% in 2020. Reading Support The average revenue per person in the market for Belts amounts to US$1.18 in 2019. Reading Support In the market for Belts, volume is expected to amount to 568.97 m pcs. by 2023. 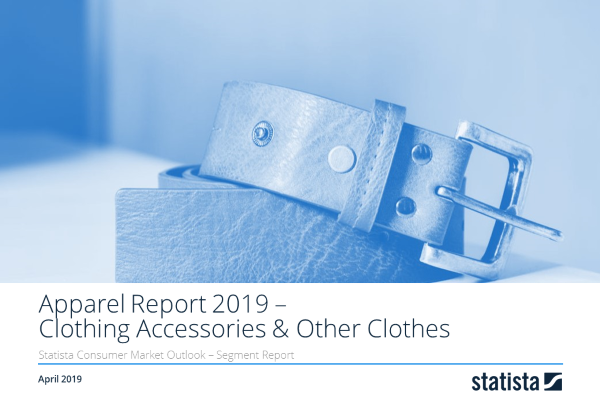 Reading Support The market for Belts is expected to show a volume growth of 0.5% in 2020. Reading Support The average volume per person in the market for Belts amounts to 0.08 pieces in 2019. Reading Support The average price per unit in the market for Belts amounts to US$15.49 in 2019. Reading Support With a market volume of US$1,905m in 2019, most revenue is generated in United States. Here you can find more studies and statistics about "Belts".